This is where it all began. Almost twenty five years ago, Ted and Renie Faver were working with a doctor in a remote village outside of Ensenada, Mexico. As a registered nurse, Renie was working with a local doctor to bring malnourished babies back to good health. Word got out, and a couple came to Renie, asking her to come see their son. She agreed, and followed them to the mountains where they brought her to Gabriel. 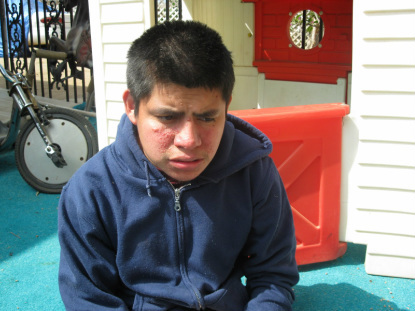 At just 7 years old, Gabriel had spent most of his life kept in an old filled in outhouse during the day and tied in a feed sack around his neck at night to keep him from hurting himself during his nightly episodes. He had epilepsy and autism, and his parents had no idea what to do or how to care for him. As goat herders, they were in the fields all day, every day. They had tried to bring him to work with them, but he had wandered away too many times and gotten lost. In what was an incredibly difficult but loving decision, they handed Renie his baptismal candle and birth certificate and said, "He's yours." And that's how Gabriel House got started. One child turned into four, four turned into ten, and so on. Today, almost 30 kids call Gabriel House their home!